Novell Filr gives you easy access to folders and files on your corporate file system. Corporate files can be files on your home drive, files on a mapped drive, or files on a remote server. Filr gives you seamless access to these files, regardless of their location. The corporate files that you have access to are defined by your Filr administrator. In Filr, you access these corporate files by clicking Net Folders in the masthead. You can upload files directly to the Filr site for your personal use or to promote collaboration. You can create folders to better organize your files. Files and folders that are located in your My Files area are visible only to you by default. You can make files and folders available to others by sharing them. Unlike files in the Net Folders area, Files in My Files do not exist on an external server, but rather on the Filr server itself. You access these files by clicking My Files in the masthead. The Novell Filr 1.0.1 Web Application User Guide focuses on accessing Filr from a Web browser. You can access Novell Filr directly from the file system on your computer (Windows or Mac). For more information, see the Novell Filr Desktop Quick Start for Windows and the Novell Filr Desktop Quick Start for Mac. You can access Novell Filr from any iOS or Android mobile device. For more information, see the Novell Filr 1.0.2 Mobile App Quick Start. In addition to starting Novell Filr from a Web browser as discussed in this section, you can also access Filr from your desktop or from a mobile device, as described in Accessing Novell Filr from Your File System and Accessing Novell Filr from a Mobile Device. Go to the URL of your corporation’s Novell Filr site. (Optional) Select Use OpenID Authentication if you do not have a Filr account and you want to sign in using your Google or Yahoo account (this leverages OpenID authentication). To use this option, you must have either a Google or Yahoo account. This functionality must be enabled by the Filr administrator. 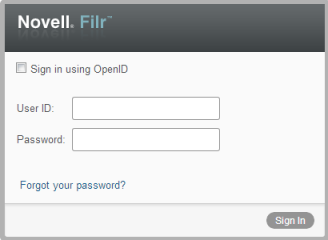 Some Filr sites will not allow authentication through OpenID. In the User ID field, specify your Filr username. If you do not know your Filr username and password, contact your Filr administrator. When you first launch Novell Filr in a Web browser, you see the My Files page. You can manage all of the files that you have created from this page. User List: Click the User List icon to see a list of all users in your system. Net Folders: View all the files and folders that you have access to on your corporate server. 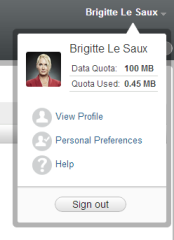 If this option is not displayed, the Filr administrator has not restricted you to a data quota. Personal Preferences: Displays your personal preferences, such as how many files you want to appear on a given page. Help: Displays the Filr Help documentation. If you have a phone number specified in your profile, you can elect to have file subscription notifications sent to you via text message. If you are unable to edit fields, it is probably because they are being synchronized from your corporate directory.